You can help support this site by making your Amazon purchases through this link, thank you. If you would like to post a review please email it to me or use my contact form and I will post it, or you may post it on my facebook page. Thank you! Hi Jennifer! 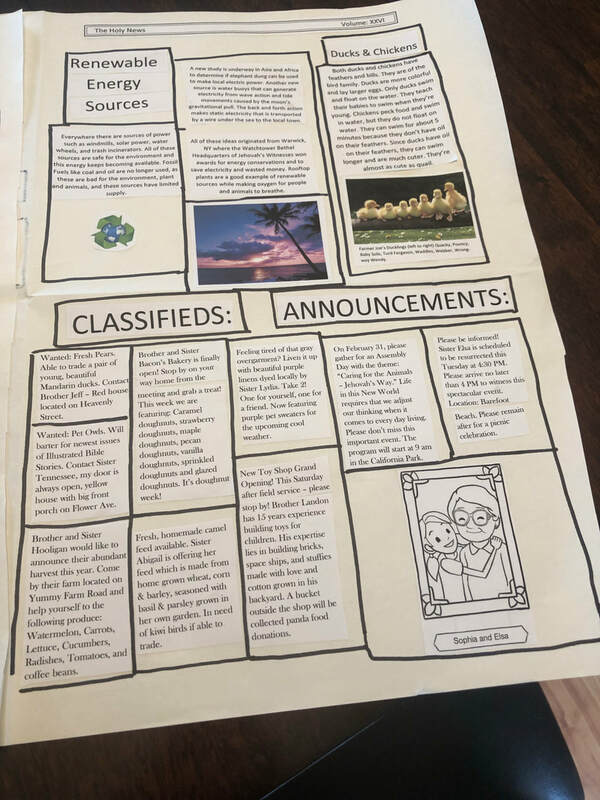 I just wanted to write and send you some pictures of the newspaper assignment for 4th grade- we decided to write the newspaper as if it were written in the new system- we had so much fun doing this project!! It’s a treasure we will keep forever!! Hi Jennifer. So we are 6 weeks into the program. We had tears and joys. But I must say I absolutely love how you set this curriculum up. It’s so easy to follow and manage. When we started out looking I was so insecure with having to be the teacher and wasn’t looking forward to this. But your schedule is so doable! It’s been such a blessing. I’m able to fill in the blanks with ‘extra’ things I feel need to be done. She is doing really well. Still working on self esteem. But that will take awhile. She is growing so much spiritually as we have more time for spiritual study. This email is to say thank you. "Hi Jenny. It is late messaging you, but I just have to tell you I have read your blog (website) thoroughly. It is very encouraging for me. I am already stressed about homeschooling and it’s only been a few months. I need to work on getting Eagan to read books and for myself to read with him. I don’t ever want to send him back to public school! I hope to continue this wonderful homeschool journey. You really are a blessing in my life! I had looked into a couple of curriculums and just wasn’t happy with them, until I came across yours. I feel as though I am not that smart because I did drop out of school, so this is a challenge for me to feel like I’m uneducated to teach my son. I have to keep filling my head head with positive thoughts and I keep telling myself that I can do this. Well Jenny, I just want to thank you from the bottom of my heart and when I need encouragement I will be reading your blog (website)." ​West Brooke Curriculum I love when students use the Notebooking method! It makes what they are learning so much more personal to draw and label a diagram of something. Notebooking allows the student to 'show' what they know, what they have personally learned from the lesson. Great Job Eagan! No, THANK YOU! This is wonderful! I really appreciate all your hard work and willingness to share with others so we don't have to "reinvent the wheel." Your guides are very thorough and instill confidence that I'm giving them a very good education and using great resources (and so many are our own). Hoping for a great year for us all! The schedule and curriculum is all laid out, but still easy to make adjustments: skipping assignments or making other little assignments as needed for each child. I just wanted to touch base with you to give you some feedback – the twins love doing the schooling, they are loving the curriculum and studying more on their own for meetings, its been a little hectic starting just with moving and everything else but they are in a good rhythm and are working so hard at it with me. We have our convention next week so this week we have focused on the program a lot. But I wanted you to know that the books, materials and information that you put together is amazing! Thank you for all your hard work!!! Looks like another year of school is over. I just wanted to thank you for the past 5 years. My daughter has graduated two years early with honors. We couldn't be more proud of her. Her future goals are to auxiliary Pioneer starting the new service year. I wanted to thank you for all the wonderful information that you have compiled so that we as homeschool moms can teach our children effortlessly. You are a true asset to The Homeschool community of Jehovah's Witnesses. I know you've had a rough year and I pray that with time your pain and the pain that your family has endured will heal. Jehovah's promise will be realized in the very near future. Thanks again for everything you've done so that I was able to help educate my child to the point of graduating with honors. Enjoy your summer, and may Jehovah continue to bless you and your family. Thank you so much! We loved your program this year and it helped us so much! Sending you love and smiles....... they are doing great with your curriculum. We couldn't do it without you! We love you to Jehovah and back! Kandra Elaine Gree/n shared a Page. Just place my order /for the kids next years Curriculum. Brennah will be in 5th, Ashlee in 4th and Connor 1st. We absolutely LOVE Jenny Westbrook and her Curriculum that she created to work with Jehovah’s Witness. You add just what they need from public school. Without all that extra mess they don’t need. And replace it with the things they do need from the FDS. It is perfect. . This will be our second year using her. Thank you Kandra Elaine Green ! Keep up the awesome work mama! Your curriculum has been such a blessing for us. We originally used K12 online, but we ran into all the same problems as being in a classroom. Holidays, birthdays, nationalism, evolution— and that was just kindergarten!!! Thanks again- have a great October! Thank you for all you do. It is truly appreciated. My Jack started to finally enjoy school last year; getting up at 6:00am some mornings and starting before I even awoke. Please be safe and we hope y’all weather the storm without much damage. My daughter went from a frustrated "school hater" to a child who starts school on her own and really enjoys the lessons. I think the spiritual element really allows her to connect with what she is learning. It's been a blessing for us. We really enjoyed last year and have been recommending you to our friends. Thanks so much for providing this service for us!!! Thank You for this curriculum it makes it so fun and organized and fits so well with our spiritual routine! We loved it last year and can't wait to start again!! Thanks for all your hard work! I recommend your Curriculum to everyone. Hi Jennifer! We are excited to be starting another year with your curriculum. We enjoyed it very much this year, recommended to quite a few of families  . 5/19/17 One of the biggest challenges in homeschooling my children has been the struggle to find an appropriate curriculum. Your curriculum has everything we have been praying for. It incorporates all of the wonderful resources put out by the society, allows for time in the ministry, and builds a solid educational foundation. I just finished Kindergarten and First grade with my girls and they are eager to start next year's curriculum. They have already read some of the books! Thank you so much for the time and effort you have put into this. It has been a blessing for my family and I am sure to so many other families as well. Well, we made it halfway! And I must say a big thank you! We love this curriculum and have told several home school JW's about it. We made it to Mexico, finally, and are settling in. Will order for next year in next few months and have sent to our address in states. Then pick up the next time we are in country. Thanks so much for your hard work. May Jehovah bless your continued efforts! Thank You! This is my second year purchasing from you, and I love your curriculum.I'm happy to tell people how great your curriculum is! 3/8/17 We just got our books. Everything is beautiful. We're so excited to start. Thanks so much, we're really enjoying it. "As long as this system goes on. I will ALWAYS use your Curriculum. Oh my goodness. This makes me excited about homeschooling again. I'm so pleased with everything. Thank you so so much." "Already diving into some of the books. My middle A...... couldn't wait till next Monday." I would like to tell you thank you for all the hard work and time you put into this curriculum. We had been praying to Jehovah to have more time for the ministry. As a single mom, this has been the greatest blessing! I have spoken with some moms in our congregation. They are interested in your curriculum for next year. As you know, it is difficult to find a curriculum to suit our specific needs. My girly teenage daughter is enjoying Wilderness Survival studies. I'm shocked! I knew she would enjoy learning about the herbs and wild plants but was not so sure about getting her hands dirty. She's ready to go camping and try out her new skills. Hi! This is G. S. I absolutely loved this curriculum! I liked how you have it in only four days so that I can have the extra day for service! I also liked how you intertwined study of the scriptures and articles from JW.org into the learning process, it has really boosted my spirituality. I have read 9-10 novels this first semester, and I think that most of them were on your list. My absolute favorites were A Single Shard, Ice Drift, and Smoky the Cow Horse. I don't think that Smoky the Cow Horse was on your list though, but it was surely a good book, despite the writer's terrible grammar! I don't know if he did that on purpose or not, but it surely fit well with the theme: a ranch in Nevada with a lot of cowboys. But thank you again for allowing me the opportunity to get closer to Jehovah by an extra day for service and for the study incorporated in the school! I just got back from a ski trip with my two teenagers and husband. We haven't gotten much academic work done this month due to taking winter break, so your newsletter was very encouraging! There are times I do doubt myself and my effectiveness as a teacher, but you helped me put the important things in perspective again. We've been enjoying this school year immensely and my daughter has been learning a lot, especially how to work out her own schedule and to be organized about getting assignments done. I've recommended your curriculum to several friends who are thinking of homeschooling their children. I can't imagine (and don't want to) what kind of problems my children would have endured by now if I had been sending them to school. I thank Jehovah when I see the school bus drive by--without my kids on it! Thanks for all your help in making a curriculum that really works and that inspires confidence in both teachers and students! Hi Jenny! What a blessing you are! I'm on the verge on completing my first year of regular pioneering and it's truly thanks to Jehovah and you and your school curriculum Thanks to your professionally designed program, you've allowed our family to focus on spiritual things and pioneer as a family. We've been able to have the flexibility and time to be there for the kids education, help different friends, allow the kids to take musical and gym classes, and yet put service and meetings first. Thank you once again for your thorough program! Ps, here we are at convention site this weekend! Amazing! Thank you so much for all of your time and effort and hard work to put it all together and make it available to us!! I have become so exhausted by trying to get them to learn what I feel is important, and meet what the schools want and have time for bible reading, studying, and trying to have fun creative Family Worship projects. I finally gave up on weekday ministry because they fell so far behind on "school work" it was causing us all added stress. I can say I have come to truly, truly dislike homeschooling, I am not organized enough to have been able to pull a curriculum like this together, and yet I always knew that it COULD be done. And now because I have it, I am looking forward to getting started!! I am ANXIOUS to continue homeschooling!! Thank you! I think this is going to be a good year! Without having met you I can see that I could learn a lot from you about parenting and making sure of the more important things. If we never meet on this side of this system, surly we will during eternity, and I will hug you then! Well my daughter is just about finished with her first year of homeschooling. She loves it! She excelled in math so much, that she now is doing 9th grade Aleks math and she's only in 7th. We are simply amazed at the quality of her education and that she actually wants to do assignments unlike the drudgery of public school that sapped her joy of learning. Now, even when she's sick, she wants to still do school! Thank you as always for your kind assistance. I recommend everyone who inquires about your program. Thanks so much! We are finishing up our first year homeschooling (2nd grade and Kindergarten), we had a great time and great success using curriculum we got from West Brooke, we're really looking forward to starting our next year. Hope you and your family are well. Its time to start looking at the next year's curriculum and books. Our family has been very happy and content using your amazing schedules! And many of the friends in the KH here and as well in other states have either switched or are planning to when they see how well the schedule works! I want to thank you for such a great curriculum. We used all your great ideas, books and resources. I'm happy to tell you Zephaniah graduated last year. We tell everyone about your Web site. With all my heart keep up the good work ....Thanks again. I just wanted to let you know I am so happy with your curriculum that you have set up for homeschool. It is amazing and it's what I wanted to do with my boys. It's one-on-one, everything is there and no jumping back and forth like the school has it setup. And to everything with the school is all online and I didn't want that. Even the text books were online. But, I just wanted to say thank you so much and soon there are a few more books I would like to order, and in July I will be ordering 2nd grade and Kindergarten. I wish I went with my gut feeling back in December to switch to you for homeschooling. But, I'm glad I did it now before I went back to that joke of public homeschool. I'm just very happy and my oldest loves it; we already did week 1. Thank you so much talk to you later. This is our 2nd year using the West Brooke curriculum. We absolutely love it. My oldest son is 12, 6th grade, and my middle son is 11, 5th grade. I am so glad that a friend told us about this curriculum. Our favorite part of the curriculum is how the society's material is used throughout the lessons. The schedules are easy for the kids to work at their own pace. And of course we love using a day for service. My littlest one is 4. She will start k5 next year. She has seen how much her brothers love school and she can't wait. I am so excited that Jenny has the curriculum for the younger grades because we want to start our youngest on it. Having this curriculum and the help and support from Jenny has definitely helped our home schooling life. We just started with the West Brooke curriculum this year. I love it. My son was working entirely on the computer prior to this year. While there are some pros to that, he was getting further and further away from actually picking up and reading a book and writing. Westbrooke is good balance between the two. While it seems to us not to be overbearing, it is thorough. Couple this with the fact that a lot of our theocratic studying is incorporated into it, makes it an ideal curriculum for JW's. I love that the mid-week meeting is studied along with history and science references. It helps a parent/teacher keep theocratic themes as the focus. Of course, as with any curriculum, the more enthusiasm you put into it, the more your student will get out of it. I also love the flexibility that is built in. We highly recommend it. 6th grade review- We truly love this curriculum. We are enjoying home schooling. I was a bit nervous to try it but so glad I did. Thank you for all your hard work into putting this all together. I highly recommend it to anyone thinking of trying it. I just love your curriculum! I am currently using the 8th grade plans. They are very logical and through. It is broad in encompassing all areas of study. I would have never known about a lot of the topics and books, that are very useful, had I never gotten your curriculum. I would (and do) highly recommend your program to every witness homeschooling parent. It's very cost effective and most books I can find at the library or inexpensive at used bookstores or online. Thank you for all your efforts in putting these programs together! All I have to say regarding West Brooke, is thank you Jehovah. For years I search for a curriculum that would not only serve my daughters academic needs, but also allow me to include her weekly Bible studies as well. I was introduced to West Brooke a few years ago, and I was so impressed, that I decided to use it all the way to graduation. My daughter is in 9th grade now, and I find that her curriculum is spot on because I get to pick a lot of what she does. The manuals are easy to follow, and allows one day off for service. This comes in handy when you want to pioneer. Jenny is also amazing, whenever I send her an e-mail, she gets back to me the same day, often within an hour. I would and have recommend this curriculum to any JW parent that is home schooling. It truly is a blessing from Jehovah. We bought the 7th Gr. Curriculum for our son and so far he's doing really well with it. We wanted to see how he does with this curriculum before switching our girls over, one is in 6th Gr. and the youngest is in 4th Gr. Since he seems to be doing well, we've decided to switch them over next month. Thanks for this really thought out curriculum thats utilizing all our wonder literature! Now everyone can be better prepared for our mtgs. We are so thrilled with West Brooke! My children are thriving off of this curriculum. It is amazing! They actually look forward to school now and feel a sense of accomplishment. I feel confident that all three of my children are getting a rich assortment of material. I am even learning! Thanks Jenny!! This is our first year with west Brooke Ethan is in 9 th grade. So enjoying the curriculum. This is our first year using West Brooke Curriculum and we love it!!! We feel it has been great for our preschooler and our 3rd grader. They are both benefiting from learning about the Bible everyday in their school day and they are getting a good education too! We have tried other school curriculums but this has truly been a blessing for our girls. The lesson Manuel is easy to follow every day and we love that it is geared for a four day week so we can go in service or go on field trips on one of the weekdays. Thank you so much for providing this!! My youngest was so excited to see all of the science books and we are looking forward to the next round! We have really enjoyed your curriculum and can't say thank you enough! Thank you Jenny yes we received it!!! We used your curriculum last year. He loved the TT and the schedule overall. We moved to a place of greater need in a foreign language group so it works well with our schedule too. I like how you are using the YPA book this year and covering it. Thank you for having this available. Another mom in my hall is also using your program this year she told me. Thank you for having it available. A blessing!!!! Hope your children are doing well and healthy !! Thank you again for the wonderful use of resources. We also just bought the unit studies and they were on sale half off. We start school today and we are super excited. Starting with the passport France unit, a real blessing for someone who has attention problems and is a tactile learner. Love your curriculums. Hi Jenny. I am Tamantha my husband order for homeschool curriculum book and etc. I read this book what you did it wonderful and helpful for us to help our son Tony. I see about Bible. Your English congregation little different than our congregation. We both deaf we go sign language congregation. I love what you make for schedule we both like it it helpful. We try tell Tony need study really we don't know what but you did it perfect. Smile. Many many thanks sister. Everything has arrived and in perfect condition. You are a good packer. Books arrived this morning about ten minutes before we were to leave for the meeting. I opened them, like a child getting a surprise gift. I spent the afternoon, going through them, and looking at the schedule. Sooo happy with everything. You are an answer to my prayers. I don't have to spend Sunday evenings planning my week, it is all done for me. Also, my backup. When I get flack or whining, I can just say, "Sister Westbrook says we have to do this" I do think he will like it and we will have a better year this round. Will be sure to highly recommend you to others. Sometimes I need to adjust the manual a little, my son is a regular pioneer. He will be starting his third year in September. As a family all pioneering we keep very busy with school, pioneering, and my three kids love music. Thank you for making these curriculums available to witnesses. I look forward to your email. The family has used West Brooke Curriculum for 7th and 8th grade, and the World History High School manual. This year, they will also be using the American History High School Manual along with Anatomy. Our family is now in the 2nd year of using West Brooke Curriculum and we love it! My daughter is now transitioning into 10th Grade and my son is moving into 8th Grade. What I really love about this curriculum is how well thought-out the material is. 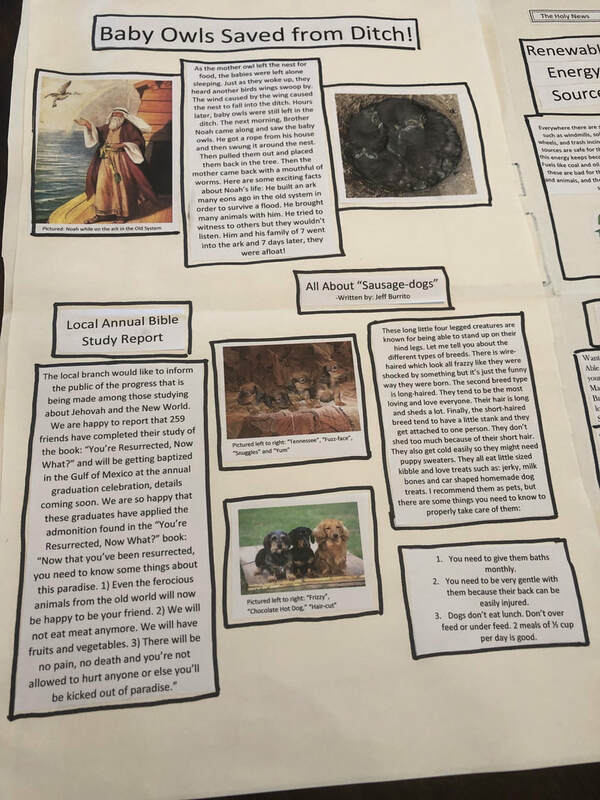 Jenny has gone to a lot of trouble to incorporate many of our Theocratic Publications into their learning process, and for this I am truly grateful! She can even help you customize your curriculum! I have the privilege of living close enough to Jenny where I can drive to her office and pick up all of the books and materials we need for the new school year. She has an amazing stock of books and learning materials! If it’s not there, she can make sure you get it. Jenny is an incredible resource for anyone interested in homeschooling their children for the first time and an excellent resource for helping experienced homeschoolers make the most of their education process. We have used online schooling, other curriculums, and doing it on our own. I wish we had used West Brooke Curriculum all along! If you try it, you’ll never want to use another! ﻿I finally downloaded the PDF 5th grade curriculum manual for my daughter to start sometime this summer. I have looked over it. I have to say I love it! It is very professional and I like all the different links Jenny included in the manual. Not only that. I didn't have to buy the books all at once, so this makes it affordable for me to purchase the books in the next 2-3 months. I look forward to homeschooling my youngest daughter using the West Brooke Curriculum!!! Thank you Jenny W.
Hello this is R.......... The things I like most about this curriculum is the math( because math is my best subject) and the Wilderness Survival. We learn a lot and it's really helpful. The books I've read lately are, Hatchet, A dogs Way home, Sounder, and I'm just starting the Maze Runner. After searching and considering other homeschool programs, DH and I decided to go with the West Brooke Curriculum. We taught DD how to read at an early age and since her birth year was the first year that our state decided to hold back the late born 5 year olds, DH and I started to shop around for homeschool programs. DD was enrolled in preschool, going on her second year but with increase costs, DH and I was looking for another alternative. Six weeks into the curriculum, we never looked back. DD has been withdrawn from preschool and she’s doing a kindergarten curriculum with some first grade books that Jenny kindly suggested. Two things that got DH and I...1.) The spiritual content and 2.) Jenny’s quick responses and helpful insight. Since DD reads, I was able to change out the package to taylor it to DD’s needs (thank you, Jenny!). Also, the book lists are nice. DD loves going to the library and searching for books for her lessons. DH and I both work FT but the program is laid out in such a way that we are able to carry out her schooling in the evenings and most on the weekends. Will I repurchase this for next year? Yes, definitely, although we will be enrolling DD into kindergarten (hopefully she’ll skip a grade), DH and I loved this program so much that we plan on using it to supplement DD’s secular education. Now is the time to spend as much time as we can with our children. The West Brooke Curriculum makes that possible for DH and I.
I ordered the 3rd grade and 6th grade manuals this morning! So excited! My 9th grader and I absolutely love the high school curriculum. It is what we have been looking for all along! Thank you. Can't wait to get my other two started in your curriculum too. My name is Tracy Miller. I live in Lexington, SC. A sister that used to be in our hall sent me a link to your curriculum last year but I had already received the books for Calvert. It was my first full year of home school. My boys are now 9 and 11. My mother lives in FL. I have a brother and sister that were going in to seventh grade. My mother wanted to home school them but had no clue what curriculum to do. So I sent her the link. She went with it and loved it so much. She raved the whole year about it. So I decided to give it a try this year. I love it so much! !! The boys have enjoyed it. It's been fun doing school this year. And having all the watchtower and awakes with lessons has been wonderful. My 9 year old hates writing and has never enjoyed grammar. I went with your language arts handbook and it has been great. He hasn't fought me to get it done. Their is no doubt in my mind that I am going with your curriculum next year. I also have a three year old and up til now I wasn't sure if I was going to start her off with home school or not. Thank you so much for all the hard work that you've put into this wonderful curriculum for witness children. Just want to let you know how much we are enjoying your 6th and 9th grade programs! Love the 7th grade Math (Teaching Textbooks) for my son. It’s just the challenge that he needed. In the 9th grade program, we chose Consumer Math. My daughter loves it! I especially want to thank you for incorporating spiritual food into their education. It has proven to help my children progress in christian maturity! In the state in which we live, both children are evaluated by a certified and licensed school teacher annually. This teacher has made positive comments about our publications being used. In her annual evaluation report, she has even mentioned some of the spiritual activities and publications as “character building” and opportunities for “public speaking.” The evaluating teacher loves your curriculum. She says we are her favorite family to evaluate! Thank you for all of you hard work and preparation! You are a gem! I really really like the program! I have a student in the 7th grade. I'd recommend it to anyone ( and do!) it's flexible and easy to follow. Detailed explanations. Like anything new, it took me a little bit of time to get used to it but I like it a lot! I love the use of the Watchtower Society materials and including it in my child's education. Jenny has quickly answered my questions. I've been able to find most the books at our local library, so I think this program is an excellent value for my money. My suggestion is to have a longer reading list? Most novels are historical but only a very small few were contemporary. Just wanted to take a minute to say how impressed I am with the quality of the books we recieved in our package today. Thank you so much for something that's even better than I expected! BTW, my son who will be 5 in Feb. was begging to do school today and he just loved the bug drawing! ﻿We LOVE the Kindergarten, Love it. We have loved all your programs thus far. Hope all is well with you and your family. Thanks again for your help and time with the curriculum and books. Used 4th manual with TT4 math last year. 5th grade manual this year. ﻿I would like to express my appreciation for Jenny at West Brooke Curriculum. I was very impressed by her willingness to answer my multiple questions, her ability to calm my nerves when feeling overwhelmed, and her professionalism. I really like the manual I received through email. They are quite thorough and of high quality. Frankly, they are more than I could have ever imagined. Thank you Jenny. I will plan to order from you each year as my children progress. Just wanted to let you know why My mom (I.D.) won’t be ordering your manual again this year for my brother. It is not because your manual for High School was not the best thing since sliced bread. Actually, my brother developed a mental illness and couldn’t continue studying. However, I will be placing an order for a manual for my 11 year old because I really believe in what you do and I appreciate all the time you will be saving me. I continue to recommend you to any Witness friends who will be homeschooling and I know my friend E...... is doing so also. So just wanted to tell you you have something great and I wish you the best! I have spent more time than I care to admit researching and comparing curriculums, methods & ideas. I knew all along that I wanted something that I could incorporate our beliefs into. Some curriculums were good but so time consuming that there would be no time left over for spiritual interests. Other methods were too lax and though there was time, there was little in the way of a secular education. West Brooke is the perfect balance! Secular education is covered, spirituality is covered and on top of that, they are blended together in a beautiful way. The schedule is laid out so nicely that I can take a little time and have everything put together for a seamless week. It's organized, it's simple ... I finally found the right fit. If I had the time or brain power, this is what I would've put together! I am looking forward to starting!! ﻿I received our packages Saturday we had our first day today! Kids love it! This is our second year using West Brooke Curriculum and I just have to say I wish I had known about it long ago. We’re going into our fourth year of home school and I believe if our family had had these resources, we would have had the confidence to begin our children’s’ studies at home from the beginning. That said, I highly recommend West Brooke’s curricula. Looking over the 11th grade schedule, I’m excited about next school year, after our awesome summer, of course. It’s interesting to note that several of the recommended books are ones that I had planned on having my son read. For instance, I just read Animal Farm for the first time, and emailed Jenny about how I thought it would be perfect to read while studying communism and she wrote back that it’s in the curriculum! My boy has his own taste in literature and he’s a good reader, but I still have to coax him to read, so I’m glad to see a great variety of suggested titles for this year. Last year, the PAC Biology course was perfect for my son, and I’m very excited about the PAC Chemistry/physics. I was thinking that I may even learn something from it! Also, I can’t stress enough how much the Teaching Textbooks math programs have improved our lives! TT is expensive- I get it, but you get what you pay for! We had used Saxon before- it was highly recommended for home school- and it worked pretty well, but West Brooke Curriculum introduced us to Teaching Textbooks, and I am SO glad because it is really the ultimate homeschool math program. Finally, again, I really appreciate the society’s literature being used extensively in this curriculum. It’s so nice to be ‘required’ to study for the Bible study and School, read the magazines, the Proclaimers book, and the Yearbook. This helps me out a lot, too, since we do this part of school as a family. I also love that he earns a speech credit for using the Theocratic Ministry School and the BE book. As true Christians, we have the privilege of having divine education. It’s only fitting that we utilize this as an opportunity to formally educate our own children at home. There has been a lot of work put into these schedules. West Brooke Curriculum takes the guesswork out of collaborating our children's' schoolwork, and I highly appreciate that! Hi. I'm using your program for my 6th grade daughter and my 4th grade son. My daughter is able to follow the schedule independently. It's very nice and I don't feel pressure trying to do everything. My son is very hyper. It takes him longer to do things on the old curriculum. This West Brooke Curriculum is perfect for him. It's simple and he doesn't feel overwhelmed. He always tellsme with joy, I finished this, and I finished that. Wow mom. I'm almost done." My first grade daughter is on another curriculum. I ordered the 2nd grade curriculum for her. She sees what her older sister and brother are doing and can't wait to finish her 1st grade curriculum so she can start her 2nd grade schedule just like them. I thank you for creating such beautiful work. I know Jehovah's holy spirit is on you to help you. You are not alone on this. My children also appreciate this very much. I also let others in my congregation know about your program. They are amazed that I'm a deaf mom who homeschools and are always asking me questions. I have recommended your program and they will check into it. I'm writing to inform you that we have completed our first semester of school and beginning our second semester of school. So far so great. Before we were doing k-12 curriculum and was very demanding it was more of a public school but at home with requirements of 6 hours a day of school, but anyways this year in this curriculum that you have managed to set up and we are very thankful for, has been amazing. We have more time to serve in the ministry which is our priority but also at the same time teach my daughter the required schooling knowledge. As long as you keep your website open we will be definitely teaching our two other children your curriculum. Thank you so much, this is what we have been wanting to find in a curriculum for our children. Keep up the awesome job. Everything has been going great. I'm able to adapt to our family situation with this curriculum. We have really enjoyed it. Also, I am going to be homeschooling my 5th grader and my 4th grader. Keep up the awesome work that you have done for spiritual sisters like me wanting to enrich our children using information Jehovah has given us. ﻿﻿Just have to say how much my son enjoyed school this year. First time in a very long time! I too enjoyed it. 10th grade with 9th grade math. Loved being able to adjust as needed. Also service day incorporated as it should be. Thank you so much for all your hard work! ﻿"Jenny I am so excited to finally find a curriculum that incorporates our Theocratic publications and leaves a day for field service. I had been looking for something like this for years with no success. I had tried making some myself but didn't really stick to them. Your curriculum is truly a blessing for our family. We have been hoping to increase our service, but as a mom of two homeschoolers 6-8 years old, I found it difficult to find the balance between the time spent doing school work and the time spent in field service. Your curriculum has helped a lot with managing our time. It is also very complete. I love how the subjects are integrated and the amount of awake articles you site for Social studies and Science. Really appreciate all your hard work. Keep it up! I have been recommending your curriculum to all sisters who homeschool and hope to continue using your curriculum for all the years to come." ﻿Want to let you know that we are thrilled to be using your curriculum for our 6th grade son. The schedule is perfect for our family, tough at times but keeps us on track. I especially appreciate how you tie everything together, Bible reading, history, meeting preparation, and science. Your manual is very well thought out. We have seen marked improvement in all subjects. Spelling has been hard for him and with Sequential Spelling he is thriving, it's amazing. We love it! We love your program!! It has been ideal for us as a family serving where the need is great. There's a perfect amount of direction to follow, plenty of subjects to research, experiments to look up but at the same time, enough flexibility in the schedule to suit it to our needs. A.......... loves reading the Proclaimers book and last night we watched Faith in Action part 1 and everything is making so much sense to her. We've been doing school 2-3 days a week as were out in the ministry the rest of the time. It's been working fine for us. We just cover more material on our school days. Thank you for creating this wonderful program. I highly recommend it to all families who are considering home school for their children or who are looking to change from a program they are already using. I especially recommend it to Need Greater families. ﻿﻿﻿Just purchased the 10th grade High School Manual to use for the upcoming school year! I am really impressed with this curriculum and how history is interwoven with information from the WT Library! I can't wait to start this with my child! Thanks Jenny for all your help and answering my many questions! ﻿Thank you so much. M...... (daughter) is very motivated in completing her work. We love the curriculum. She is even ahead in some of the classes. Love that she is preparing for the meetings. Thank You for all the hard work and dedication you put into this curriculum. "We absolutely love the 7th grade curriculum. It's easy to follow and has made my job as "Teacher Mom" more enjoyable! Thank you for creating a curriculum that is the perfect blend of secular learning with Jehovah's way! We are looking forward to next year!" I'm writing to inform you that we have completed our first semester of school and beginning our second semester of school. So far so great. Before we were doing k-12 curriculum and was very demanding it was more of a public school but at home with requirements of 6 hours a day of school but anyways this year in this curriculum that you have managed to set up and we are very thankful for has been amazing. We have more time to serve in the ministry which is our priority but also at the same time teach my daughter the required schooling knowledge. As long as you keep your website open we will be definitely teaching our two other children your curriculum. Thank you so much, this is what we have been wanting; to find a curriculum for our children. Keep up the awesome job. and appreciate many past and present articles. We look forward to next year! Thank you so much!! Hello my name is Caleb D. D. and I really love this curriculum and the things we get to do. it's very exciting and adventurous. I'm very happy you did this or else I would still be in middle school with all the bad association. Hello this is Rikkilynn and I love your program. I like how you added our spiritual things. I love all the stories you make us write. My favorite was the Wrong Bus Stop story. I did really good on it. I really used my imagination and came up with some cool stories. I also like typing and math. There are no changes I would like you to make. I've been reading a lot of books. So far I've read four. I really like Mrs. Frisby and the Rats of NIMH. Your curriculum is perfect! I love, love ,love this curriculum!!!!! Jenny has spent many hours searching our publications to include them in this program and the results are AWESOME! In addition to that,she has looked at various ways to make learning interesting for the kids. In the 9th grade program she uses videos from the History Channel for US History that my daughter loved!! The school schedule is easy to use and she has done all the hard work of planning for you. All this for a VERY reasonable price!!!!! I love this program!!!! It is a lot though. We still can't get everything done in one day but that will be our goal for next year. I know my children will be prepared for the ministry, theocratic school, assemblies, conventions and any turn life might throw them not only has this program allowed my family to go out in the ministry more but we have grown closer to each other and Jehovah. I am very very thankful to have found West Brooke. I love your curriculum every bit as much as I knew I would! If I could create my own dream curriculum, it would look just like yours! I love that the schedule is laid out for us in such an easy-to-follow manner. I love that it incorporates our publications and our Witness lifestyle throughout, from the 'Was it Designed?' articles to the mention of field service in the worksheets. I also love the 4 day school week that allows for a field service/field trip/errand day without messing up the schedule. I also love how easy it is to modify for our individual needs. The only things I have added in is a daily worship session (Daily text, scripture memory, bible reading and a Kingdom song). We have tried several different curricula and my daughter really didn't enjoy any of them... she loves yours and actually looks forward to school! Thank you!! Thanks for the opportunity to tell others how I feel about your curriculum. In 3 words, I LOVE IT!!! This is the first year I am using West Brooke. I have been home schooling my daughter since first grade. She is now in seventh grade. I have been creating my own curriculum all those years...A lot of work!! You make it easy! Everything I need is right there in my manual, all I have to do is follow it day by day. I also love the way the Society's publications are used. This really brings home the point the spiritual things comes first...even in our education. I plan on using West Brooke all the way to high school graduation. Thanks again for all your hard work. I so love all that you have done, thank you sister, really. I am doing the 7th grade for one child and really need a 9th grade for the other is this something that will be coming out soon? or when do you foresee that? Thank you sooooooooooo much for all your effort and time. I have home schooled each girl one at a time and for the first time this year both, so I am a bit anxious, but getting there. I was soooooo happy to find your curriculum because I wanted something to incorporate Jehovah. I am raising my kids as witness' but was not raised myself that way, so this is God sent, if you will. Putting it all together is mind blowing so the fact that you are so advanced and on top of things helps us "younger" ones in the truth. What a fabulous gift of praise you give to Jehovah, by being able to help the rest of us in that regard. I am definitely going to get the 8th grade and as soon as you move on the rest also. So far I have found everything to be good to go. I like the interaction and different web sites great. Just wanted to touch base with you. I am absolutely thrilled with your curriculum. All that you have suggested is working so well for us. My son loves loves loves the Aleks math and does it with great enthusiasum. He liked math before, but now he is having fun with it too. I love the social studies/history books. Everything. I am loving it!! While I may not stick entirely to the program, there are just some days....... LOL. But I have to tell you that, the math program (Aleks) excites him to want to do math... the social studies is really nice. I bought the extra book that has coloring pages, and maps to fill in and extra exercises to do with each lesson. I'm really trying to keep up with all the bible study aids that you have included. I'm trying hard to not let anything come before Jehovah. Seems like every week there is something, but I am more on track thanks to you than ever before. I tell EVERYONE about your program. We love West Brooke! This year has been great. We print 2 weeks of school at a time & my daughter gets her school DONE. I don't have to nag she just does it. She likes the program. I think breaking it up with books for some subjects & computer for others is what she needed. Thank you for creating this program! We love it! Finally school is not a hassle! We are using the 8th grade curriculum with tweaks made for 9th grade. It is the first curriculum my son has willingly done on his own with little prompting from. I will definitely be using this for next year along with the 5th grade for my daughter. Thank you so much for a great job and keep it up! My daughter loves it and its so easy to use compared to spending hours trying to locate information for each subject. Mom: My daughter and I really like this program, I do not have to make her do her work, she does it and often without calling me for help. Thank you. Daughter: Thank you, Thank you, Jenny for this program it is so much better than what I was using before. They are using American History with Basic Biology for 10th grade. I love the 4th grade manual! Jenny , I can't tell you how much I love your stuff. I have been looking through it. Amazing!!!!! I can't thank you enough, Zeph loves it too, and that's the greatest. Tyna. I just want to start by saying I am so excited to get to know you! Thank you so much for putting this together, it is exactly what I was looking for. By the way, I showed your manual to my parents and siblings this weekend. I was scared to death as my family is quite anti-homeschool. (Sister is Spanish and English teacher and brother is elementary coach and assistant principle.) They took it badly (as expected) but could not say enough about the work you put into the lesson plans. They were EXTREMELY impressed! My sister loved the amount of wt/awake articles included. They kept saying that if I follow it she will have a very well rounded education. It won them over in the end, as much as they can be won over. Thank you again. "I reviewed you curriculum and its wonderful. We can't wait to get started. Thanks for all your hard work." After five years of using Sonlight, I finally feel like we have a curriculum that embraces our core beliefs. Thank you so much for taking the time to create this manual. Seventh grade promises to be one filled with endless possibilities. I have wanted my ds, 13 to study the Proclaimers book and I now have a plan of attack....THANK YOU! Also, I had been prayerful about field service during the week this year. Jehovah answered my prayer when I found your site. Now, I have a well planned week complete with loads of spiritual food! Thank you again for all of your hard work! I have to say Thank You to West Brook Curriculum and that I’m super excited about teaching homeschool this year! We had a really rough year last year for many different reasons, and I needed an alternative to what I was doing before, which was creating my own curriculum and schedule. We looked into online public school for my younger son and we were contemplating sending my oldest son back to public school. My husband and I had misgivings about both those choices. Then, I remembered having seen West Brook curriculum online and looked into it further, and the more we looked, it was clear that it made the most sense for our family. I love that the society’s publications are used extensively in the programs. If you think about it, after school is over, the society’s publications will likely be the reading material that they will use the most. I also like the fact that the curriculum will keep the boys on a schedule of studying for the ministry school and service meeting- something that can sometimes get rushed through or even neglected from time to time. The program keeps the children on a constant reading schedule, as well- I’m looking forward to revisiting some of the classics I loved as a kid, and we will be reading some of them aloud together – something that all of us enjoy. The social studies, math, and grammar selections are straightforward and easy to use. In the past it’s been hit or miss with the books that we’ve chosen for these subjects, particularly in the subject of science. Science can be such a challenge because books tend to either lean towards evolution or an overly preachy tone, depending on the agenda of the author. West Brook takes all that guesswork out because everything has been carefully researched and the assignments are all set up and interspersed with the society’s publications so that our children can get an education free of the misconceptions often thrown at them in school. My favorite part of West Brook is that all the assignments and scheduling has been done. What a blessing that is. Think of all the hard work that went into compiling that! I know because I used to compile my curriculum week by week and I’m so glad that this timesaver is available. It takes the guesswork right out of it. As Witnesses, we have a lot of wonderful resources, and I feel that this is among them. Just wanted to tell you that after using this for two days we both love it! The schedule for everything is great. It's simple and not taxing on him or me. I love having the grid print out where I can add things, such as a daily bible reading, and I want to add in learning the books of the bible. I pro-clicked it into a spiral book and I'm ready to go. I don't have to struggle! Oh I love the free grammar too. Wish I would have known about it sooner, I wouldn't have bought growing with grammar last year! I'll use both of them, since I have it. The map book is great too. I got the download and loaded it onto my iPad. Works beautifully! 10/7/13- This is our first day of week 2 and let me say it has been WONDERFUL! We started with a virtual public school and they said that they were very flexible. We found that to not be true at all and still had to follow everything exactly and this stressed all of us out. This is also our first year homeschooling so that in itself was a huge adjustment. When we found that it was taking over 6+hrs 5 days a week to school. This was not including the spiritual things that I wanted to add.....so this has definitely been a blessing for us totally! 9/5/13 Hello Jennifer, By the way, I think what you've done is fantastic! What a loving thing to share it with others. I'm interested in the 3rd grade program and may even pull my 6th grader out of the online program she's in to do this as well. Thank you sister! 9/24/13 We are enjoying the curriculum. I just wanted to say, this curriculum makes me feel like a homeschooling rock star. Thank-you so much! Hi Jenny! Your curriculum exceeds anything out there - by far! I am excited to start (my son) with this curriculum. We are going to do Teaching Textbooks for math. Thank you for sharing your labor of love! Much love to you and all in the congregation. Debby's son used the 7th grade Manual last year and is starting 8th with Earth Science this year. Sorry for not letting you know yesterday... the books have arrived safe and sound.. (not opened at all)… thank you so much for all your trouble! We had a great time opening the package and absolutely delighted at your book selection.. (we cannot get books of this calibre here).. Ed Hirsch’s book “What a Second Grader Needs to Know” especially impressed me as I was expecting the normal psycho babble – but it is not… it is more like a practical guide for the different subjects to educate a second grader! I briefly browsed through the manual and viewed some of the sited resources on the web.. Very impressed particularly with the science sites.. The manual is a highly comprehensive and indicates the hard work of a dedicated and devoted homeschool mum. I was introduced to Maths Mammoth (Maria Miller) by Jenny and have personally found that the mastery method of teaching math far superior to that of the spiral method of teaching so common today. I look forward to using this wonderful manual to teach Second Grade to my daughter next year.